I tried a variety of different sizes and found that clay flowerpots between 4 and 5 inches in diameter work best. The key is matching the pot with a hole saw that is has a diameter about half an inch smaller than the pot. I reccommend boards that are at least 2 inches wider than that the diameter of the pots. I used 1/4" diameter rope that was intended to be used as a clothesline. I think a thicker rope would add a nice aesthetic to the garden. Zip ties – also called cable ties or tie wraps – come in a variety of different sizes. I tried both large 10" ties and thinner 4" ties. The thinner ties are much easier to work with. Hole saws are used with drills to cut large circular holes. They typically come in 2 pieces. There is an outer saw piece that attaches to an inner arbor piece. A single arbor can work with a variety of different sized saws. Use a pencil to mark the hole locations on a board. Make sure you leave about 2" between the flower pot holes and about 1" between the rope holes and edges of the board. 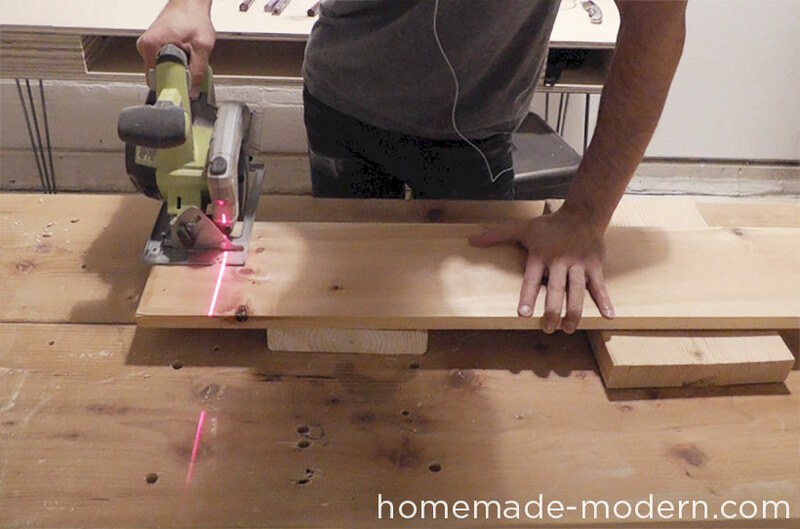 Once you have established the hole locations, you can trim the boards to the desired length with a circular saw. If you lay out the boards in advance, you can have the boards cut for you at Home Depot. I purchased 6' boards and cut them in half. The key to this project is making sure the holes are aligned. Rather than marking each board, I simply marked one and drilled small pilot holes through the entire stack of boards. 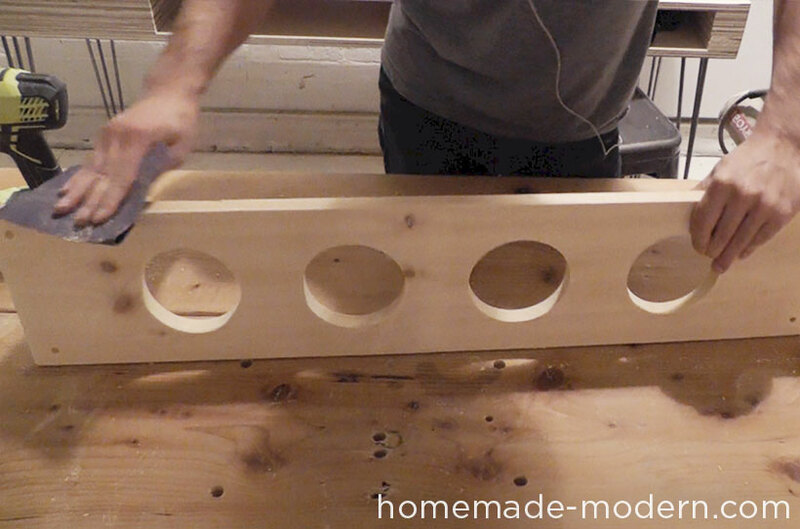 These small holes will serve as guides for the hole saw. Hole saws can be a bit tricky to handle. The larger diameters can generate a lot of friction with wood so it's important to properly secure the boards and have a firm grip on the drill. 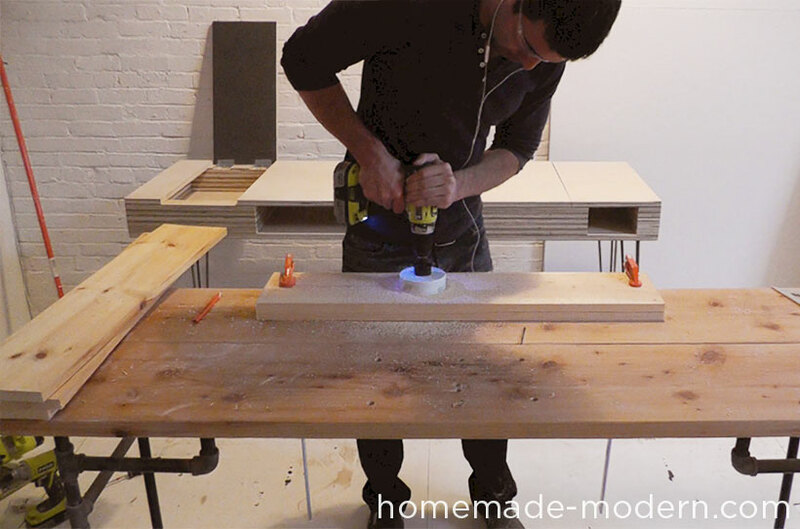 I clamped the boards two at a time to a work table. 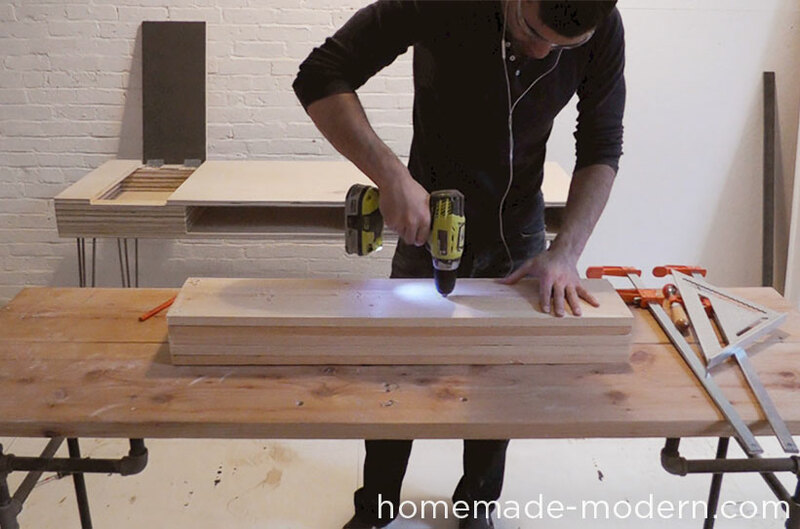 Set your drill to the drilling mode at the highest speed and use both hands. The saw will occasionally freeze up and bind against the wood, so be patient and try and keep the drill perpendicular to the board. I used a 5/16" drill bit for the 1/4" rope. It's important to have a tight fit for the rope so that the zip ties create a stopper to keep the boards from sliding. 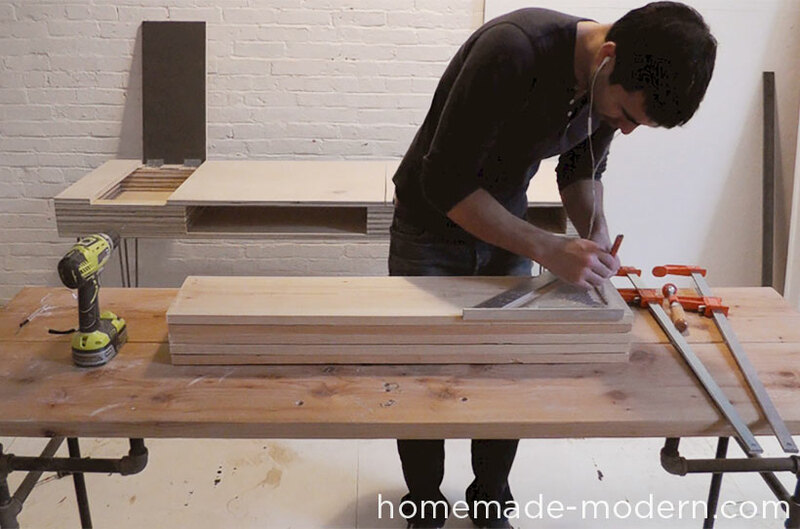 Pine is a soft wood, so you can hand sand the boards pretty quickly. I used an orbital sander and sanded them with 220 grit paper. Thread the rope through the holes and tie a knot at the bottom. 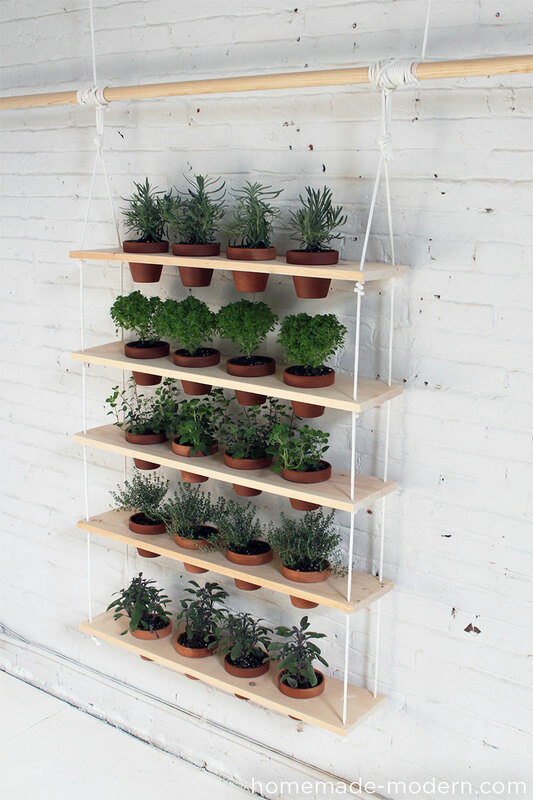 Make sure you are hanging the garden from a location that can support the weight. Closet shelf brackets work well. Try your best to level the boards. You can adjust the leveling with the zip ties. You want to make sure you have adequate space for the plants between the boards. 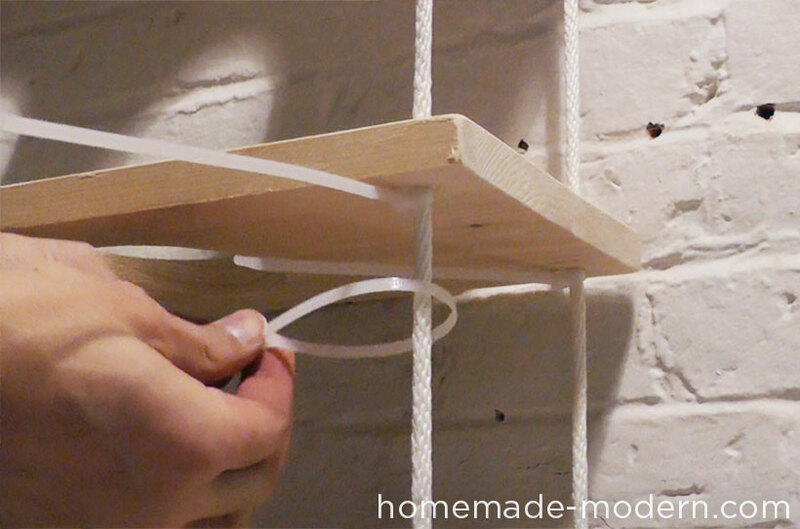 Adjust the boards into the right location and use zip ties under the rope holes to secure them. I started with a single zip tie with a loose fit, which allowed me to slide the zip tie along the rope into the right position. Once I got the right placement, I added 2 to 3 tight zip ties underneath each rope hole to make sure the boards wouldn't slide under the weight of the potted plants. Put your potted plants in the holes, step back and enjoy! 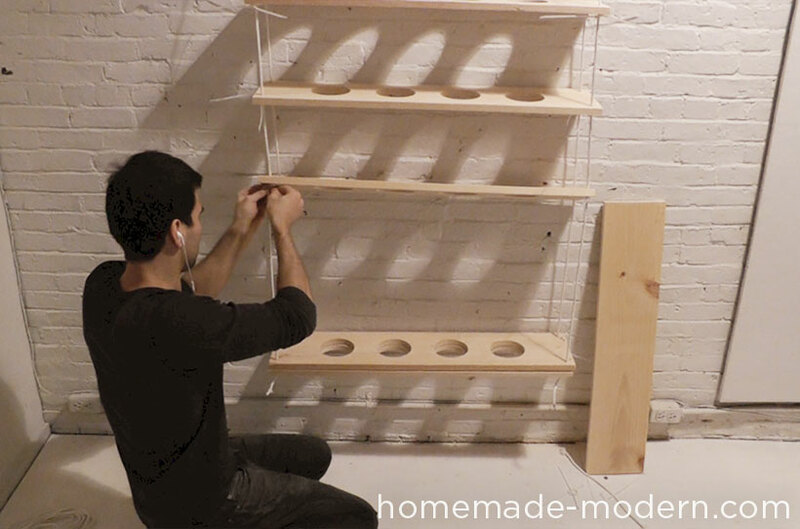 You can use the same method to make a single shelf supported by brackets. Use small glass bottles and wire to catch the water that drains through the pots. Terra cotta can be painted, so there are all sorts of nice color combinations you can play with. 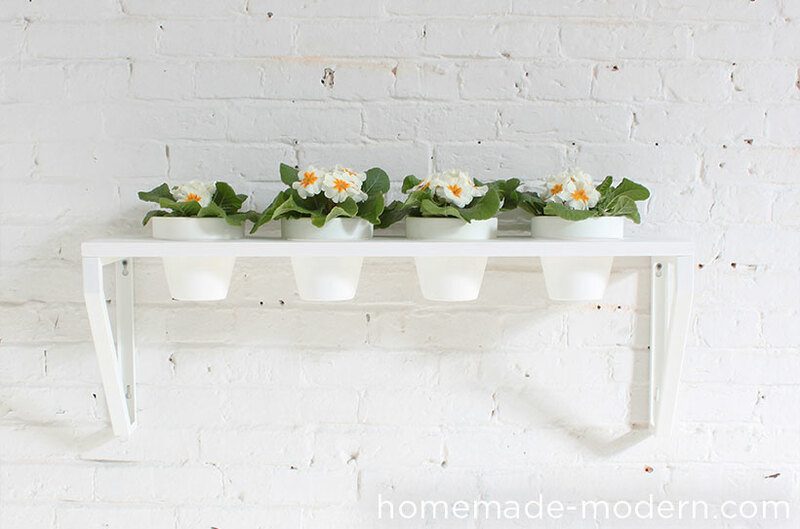 Good luck making your own hanging garden and please email or tweet photos to @benuyeda or ben@homemade-modern.com. For more detailed instructions, dimensioned drawings and different variations of the project, check out our soon-to-be-released book.